BROWN GIRL DREAMING has six starred reviews, presumably six best of the year lists (where are you Bulletin? ), the National Book Award, and it’s placed the highest through our two rounds of unofficial nominations. It’s a shoo-in for the Newbery Medal, right? I’d like to think it has a very good chance. Personally, I find THE FAMILY ROMANOV to be slightly more distinguished, but only by a hair and if BROWN GIRL DREAMING is easier to build consensus around (and that appears to be the case) then this is the other book that would make me extremely proud to recognize. 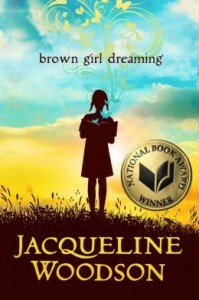 BROWN GIRL DREAMING is not a perfect book. Some people find the beginning and/or the ending to be slightly off. Me, I like the beginning just fine, but the ending seemed too abrupt and lacked sufficient closure. The fact that she leans on the perspectives of relatives to flesh in her early years is not problematic for me in terms of voice. Rather, I found that it hearkened back to another of her Newbery Honor boooks, SHOW WAY. That one focused on the oral family history of her maternal line. ”The Woodsons of Ohio” provides a nice counterpoint, drawing on the oral family history from her father’s line. I don’t know that I could bring this last point up at the table, but I almost feel like Woodson has come full circle here, and it’s only fitting that if she wins the Newbery Medal that it be for this particular book, not just arguably her best book, but one that is so personal and universal at the same time. Another fault I will acknowledge: I don’t know that this one ever rises above the standard complaints of the verse novel, and indeed Nina sought to rebrand this as “lineated prose pieces” in order to distance this work from those. This is not a comment to bring up around the table, but there are two verse novels in the cannon–OUT OF THE DUST and INSIDE OUT & BACK AGAIN–and I find this one to be every bit as good as those, if not better. On the other hand, I’m not sure that the poetry here is as uniformly excellent as it is in HOW I DISCOVERED POETRY nor that the narrative as well constructed as THE CROSSOVER. So, for me, BROWN GIRL DREAMING is clearly not a perfect book. And yet I find it to easily be one of the most distinguished books of the year, and here’s why. The highs of this book are so high that it mitigates and masks the weaknesses, so that the sum total still nudges ahead of 99.9% of the field. Now I neglected to bring the book home over the holiday break so you will have to wait until I return to my office on Monday so cite specific examples from the text, but I would encourage you to do so below in the comments as well. Which passages did you find the most moving? The most beautifully written? Many of us have our hearts pinned so firmly on this book that I fear it will be devastating should it fall to an Honor book or worse yet receive nothing at all (think: MR. TIGER GOES WILD), but perhaps we should explore that possibility, too. The last time the same book won both the National Book Award and the Newbery Medal was in 1999 when HOLES accomplished the feat. That’s fifteen years ago, so it doesn’t happen that often. I was on two committees that were widely expected to rubber stamp the the National Book Awards: The 2006 Newbery was supposed to recognize THE PENDERWICKS, you’ll remember, and the 2008 Printz was supposed to recognize THE ABSOLUTELY TRUE DIARY OF A PART-TIME INDIAN. So I know that it’s not really that the committee doesn’t like being told what they should pick, but rather that we simply haven’t read as broadly and deeply as they have. (For example, how many of us have read both BROWN GIRL DREAMING and HOW I DISCOVERED POETRY? The two works are similar enough that they beg for comparison, and if you haven’t read both then who are you to say that the latter book is not, in fact, more distinguished?) And I feel that way especially this year (that I haven’t read broadly and deeply enough this year), I keep saying that I only like two books, but I think that’s due to the fact that I’m focused on other things this year.